Prospective students for LIU Post’s new undergraduate program in veterinary technology (vet tech) were welcomed to the campus for the program’s first open house. 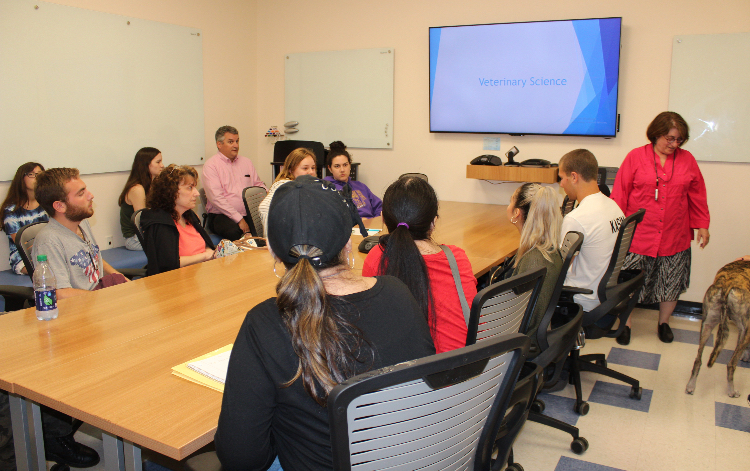 This event was co-hosted by the admissions department and the veterinary technology department on Wednesday, June 13. Dr. Robin Sturtz, director of the vet tech program, lead a presentation welcoming both prospective students and their parents. More than 22 students and 10 parents attended the event, and were able to ask questions to admissions officers about the application process. Potential students listened to a presentation by Dr. Robin Sturtz, director of the vet tech program. 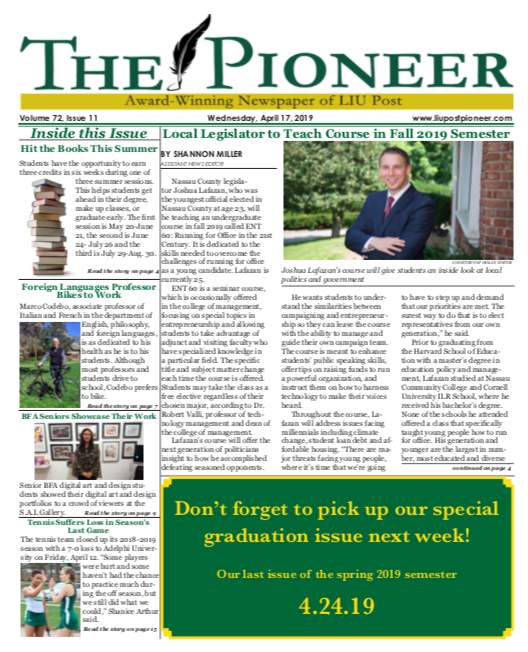 “There’s going to be very rigorous courses [for the program],” Sturtz said, “I’ll be meeting with every student in the program each semester to ask what they need.” A tentative freshman course outline includes introduction to veterinary science, veterinary anatomy and physiology, a freshman seminar course and liberal arts credit courses. Eilene Chirino, a sophomore from SUNY Canton, said the program outline seemed to differ from previous experiences. Students at the event received immediate hands-on experience with animals. Camo, an 8-year-old greyhound, was the “guest of honor,” serving as a patient in a demonstration. 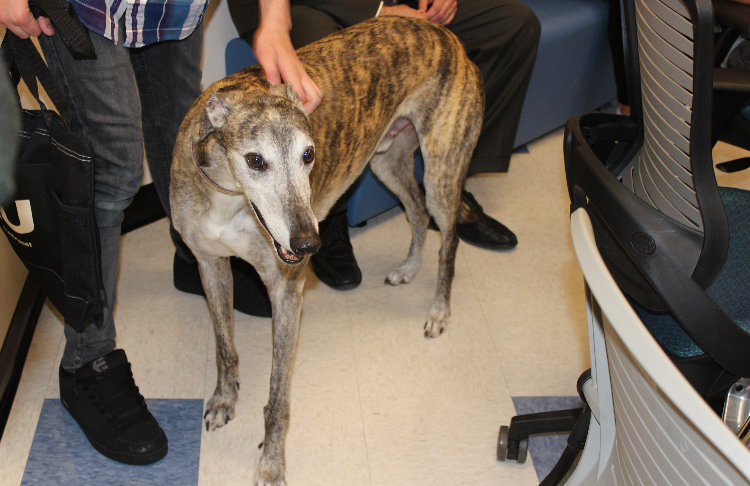 Camo, an 8-year-old greyhound, served as a patient in a demonstration. Sturtz said students coming into the program will participate in extensive externships during their four-years, allowing more than 500 hours to work hands-on with animals. Although students interested in the program are assumed to have an interest in animals, Sturtz warned the potential applicants that being in the field of veterinary technology does not mean they will be free of dealing with humans. 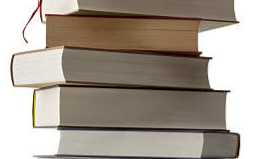 Kate Haughie, director of international admissions for Post, said that though the veterinary technology program is new, it is already important for the university.